Diagrams are used to help visualizing and understanding processes at many different levels. Each of the diagrams provides a simplified view of the overall process, allowing to break down the complexity of the overall process. The most commonly used language for the process modeling is UML. Below is a brief introduction to two UML diagrams that are frequently used. 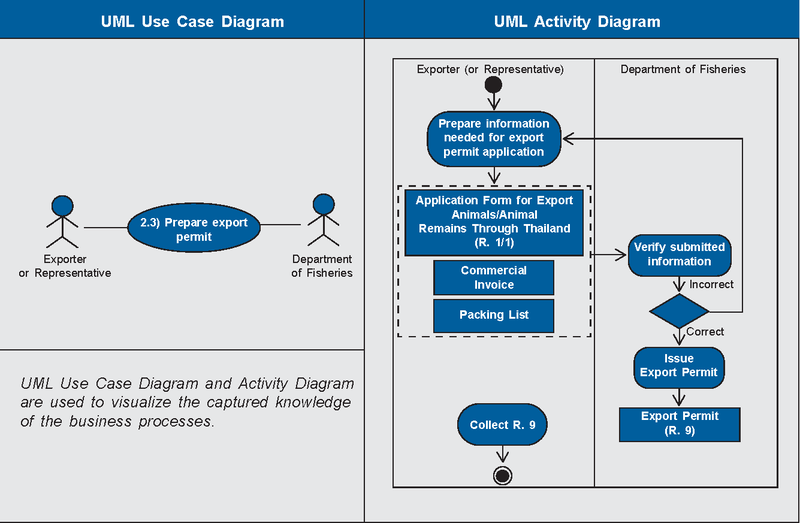 Use-Case diagrams are used to show the requirements by the parties involved in the selected process. Acticity diagrams list the high level activities fo the process. The processes and data exchanged in each high level activity is further documented in the Activity diagram. Authority: Customs, Other government agencies such as Health, Immigration, Veterinary, Agricultural. Authority, Authorized Person or other Person seals the consignment . (The loader/shipper/consignor/consolidator/etc may have the responsibility to seal the consignment to the relevant standards, and details noted on the Customs documentation). An activity diagram reflects the behavioural aspects of the process model. It shows the flow of activities, specified by actors and includes information on the objects , such as data or documents transmitted or produced. The actors are shownin terms of "swim lanes". Usually an activity diagram and a use-case diagram complement each other with the activity diagram providing more detail on the activities occurring in a particular use case. (see illustration at the top of the page). The Customs example shows the activities involving the Supplier (or his Agent), the Transporter and various Customs and other Authorities in the inspection and clearance of goods for departure from a country (Source: Buy-Ship-Pay Model).